My baby died before I got to hold him in my arms. I’d been in the hospital for three weeks, trying to save my third pregnancy, but then one morning I went downstairs for my twice-daily ultrasound and found out he had died while I slept. Then came the horrible and unavoidable realization… I had to give birth to him. For three hours I laboured, knowing that at the end of it, instead of a baby suckling at my breast, I would hold death in my arms. That’s the hardest kind of liminal space I’ve ever been through – excruciating pain on top of excruciating grief. Yes, it was hard, but it was also one of the most tender, beautiful, grace-filled experiences of my life. It changed me profoundly, and set me on the path I am on now. That was the beginning of my journey to understanding the painful beauty of grief, the value of the liminal space, and the essence of what it means to hold space for another person. When Matthew was born, the nurses in the hospital handled it beautifully. They dressed him in tiny blue overalls and wrapped him in a yellow blanket, lovingly hand-made by volunteers. They took photos of him for us to take home, made prints of his hands and feet for a special birth/death certificate, and then brought him to my room so that we could spend the evening with him. I asked one of the nurses later how they’d known just the right things to do, and she told me that they used to be frustrated because they didn’t know how to support grieving parents, but then had all been sent to a workshop that gave them some tools that changed the experience for the parents and for them. That evening, our family and close friends gathered in my hospital room to support us and to hold the baby that they had been waiting to welcome. Now, nearly sixteen years later, I don’t remember a single thing that was said in that hospital room, but I remember one thing. I remember the presence of the people who mattered. I remember that they came, I remember that they gazed lovingly into the face of my tiny baby, and I remember that they cried with me. I have a mental picture in my mind of the way they loved – not just me, but my lifeless son. That love and that presence was everything. I’m sure it was hard for some of them to come, knowing what they were facing, but they came because it mattered. This past week, I’ve been in a couple of conversations with people who were concerned that they might do or say the wrong thing in response to someone’s hard story. “What if I offend them? What if they think I’m trying to fix them? What if they think I’m insensitive? What if I’m guilty of emotional colonization?” Some of these people admitted that they sometimes avoid showing up for people in grief or struggle because they simply don’t have a clue how to support them. There are lots of “wrong” things to do in the face of grief – fixing, judging, projecting, or deflecting. Holding someone else’s pain is not easy work. In her raw and beautiful new book, Love Warrior, Glennon Melton Doyle talks about how hard it was to share the story of her husband’s infidelity and their resulting marriage breakdown. There are six kinds of people who responded. The Victims are the people who “write to say they’ve hear my news secondhand and they are hurt I haven’t told them personally. They thought we were closer than that. These are all people who may mean well, but are afraid to hold space. They are afraid to be in a position where they might not know the answer and will have to be uncomfortable for awhile. Wrapped up in their response is not their concern for the other person but their concern for their own ego, their own comfort, and their own pride. It’s easy to look at a list like that and think “Well, no matter what I do, I’ll probably do the wrong thing so I might as well not try.” But that’s a cop-out. If the person living through the hard story is worth anything to you, then you have to at least show up and try. Don’t worry so much about what you’ll say. Yes, you might say the wrong thing, but if the friendship is solid enough, the person will forgive you for your blunder. If you don’t even show up, on the other hand, that forgiveness will be harder to come by. So show up. Be there in whatever way you can and in whatever way the relationship merits – a phone call, a visit, a text message. Just be there, even if you falter, stumble, or make mistakes. And when you’re there, be FULLY present. Pay attention to what the person is sharing with you and what they may be asking of you. Don’t just listen well enough so that you can formulate your response, listen well enough that you risk being altered by the story. Dare to enter into the grit of the story with them. Ask the kind of questions that show interest and compassion rather than judgement or a desire to fix. Risk making yourself uncomfortable. Take a chance that the story will take you so far out of your comfort zone that you won’t have a clue how to respond. And when you are fully present, your intuition will begin to whisper in your ear about the right things to do or say. You’ll hear the longing in your friend’s voice, for example, and you’ll find a way to show up for that longing. In the nuances of their story, and in the whisperings they’ll be able to utter because they see in you someone they can trust, you’ll recognize the little gifts that they’ll be able to receive. It is only when you dare to be uncomfortable that you can hold liminal space for another person. This is not easy work and it’s not simple. It’s gritty and a little dangerous. It asks a lot of us and it takes us into hard places. But it’s worth it and it’s really, really important. When we’re too uncomfortable to hold space for another person’s pain, we push them into this kind of spiritual bypassing, not because we believe it’s best for them, but because anything else is too uncomfortable for us. But spiritual bypassing only stuffs the wound further down so that it pops up later in addiction, rage, unhealthy behaviour, and physical or mental illness. Instead of pushing people to bypass the pain, we have to slow down, dare to be uncomfortable, and allow the person to find their own path through. 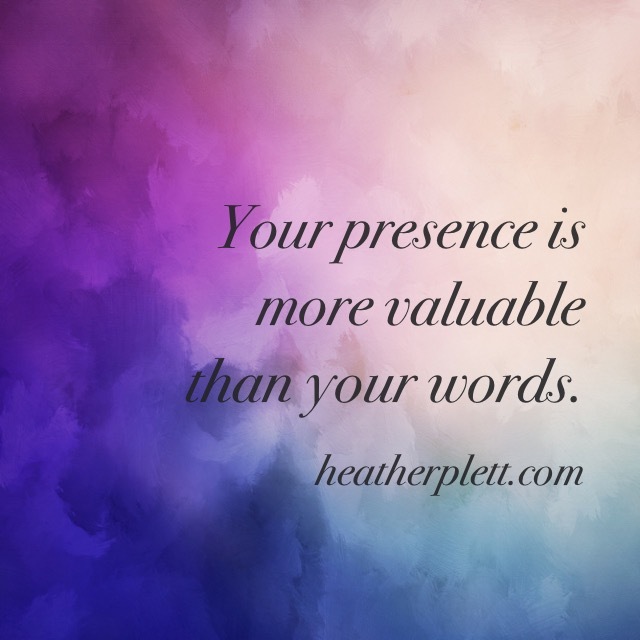 There’s a good chance that the person doesn’t want your perfect response – they want your PRESENCE. They want to know that they are supported. They want a container in which they can safely break apart. They want to know you won’t abandon them. They want to know that you will listen. They want to know that they are worth enough to you that you’ll give up your own comfort to be in the trenches with them. Your faltering attempts at being present are better than your perfect absence. My memory of that evening in the hospital room with my son Matthew is full of redemption and beauty and grace because it was full of people who love me. None of them knew the right things to say in the face of my pain, but they were there. They listened to me share my birthing story, even though there was no resolution, and they looked into the face of my son even though they couldn’t fix him. Nothing was more important to me than that. A new online writing course… If you want to write to heal, to grow, or to change the world, consider joining me for Open Heart, Moving Pen, October 1-21, 2016. An emerging coaching/facilitation program… As I’ve mentioned before, I’m currently writing a book about what it means to hold space. While writing the first three chapters, I began to dream about what else might grow out of this work and I came up with a beautiful idea that I’m very excited about. I’ll be creating a “liminal space coaching/facilitation program” that will provide training for anyone who wants to deepen their work in holding liminal space. When I started dreaming of this, I realized that I’ve been creating the tools for such a program for several years now – Mandala Discovery, The Spiral Path, Pathfinder, 50 Questions, and Openhearted Writing. Participants of the coaching/facilitation program (which will begin in early 2017) will have access to all of these tools to use in their own work, whether that’s as coaches, facilitators, pastors, spiritual directors, hospice workers, or teachers.